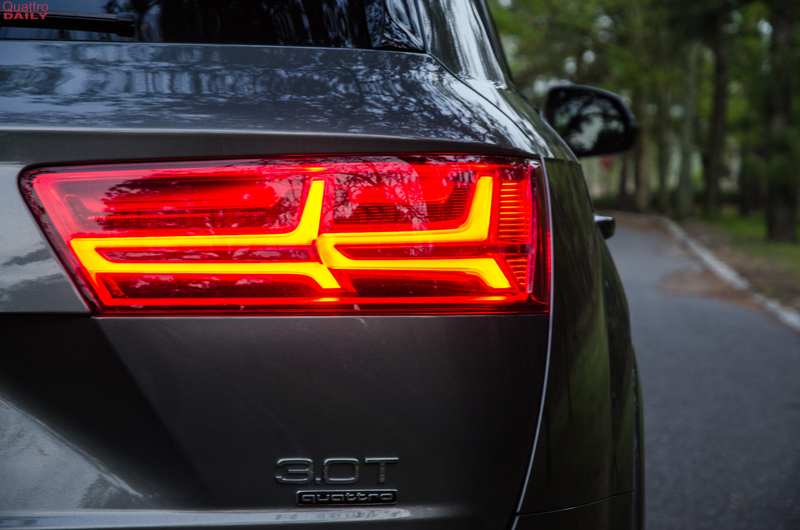 This current, second-generation Audi Q7 made its debut back in 2015. While that isn’t a very long time ago, there have been several new competitors to debut in its segment since then. 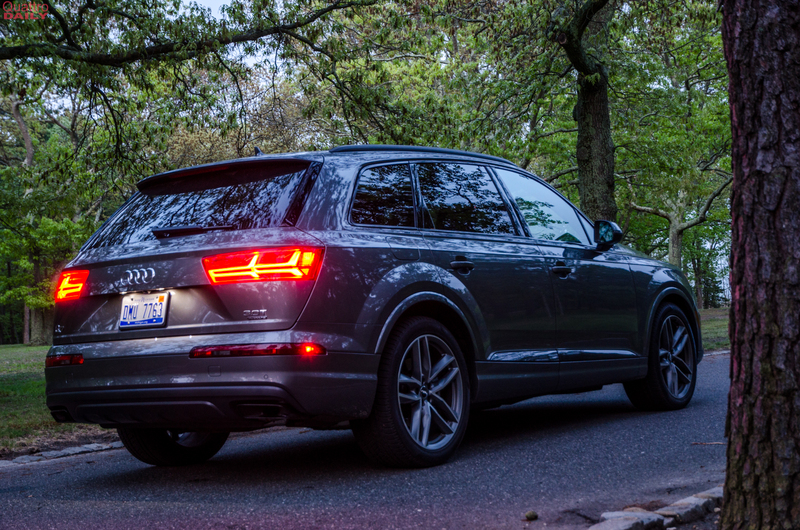 So, despite the fact that the current-gen Q7 isn’t old, it’s still one of the oldest cars in the segment. Cars like the Jaguar F-Pace, Land Rover Discovery and Volvo XC90 have all debuted since and are all excellent in their own way. 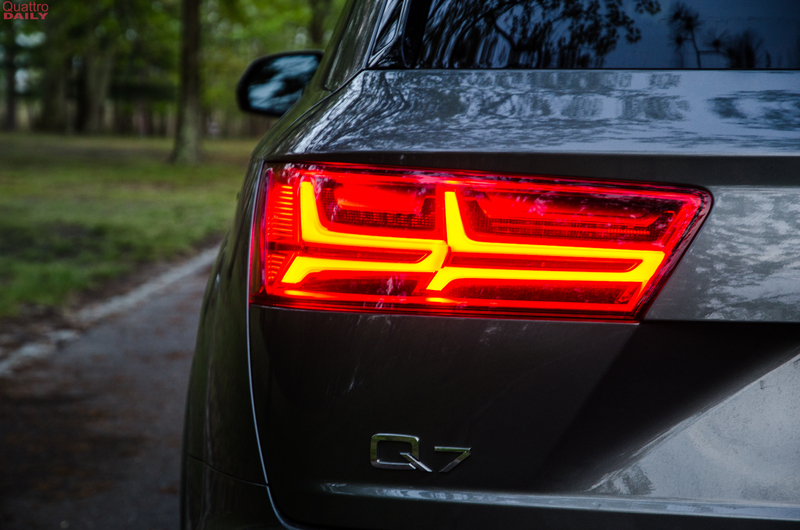 So does the Q7 still have what it takes to take these newest competitors head-on? 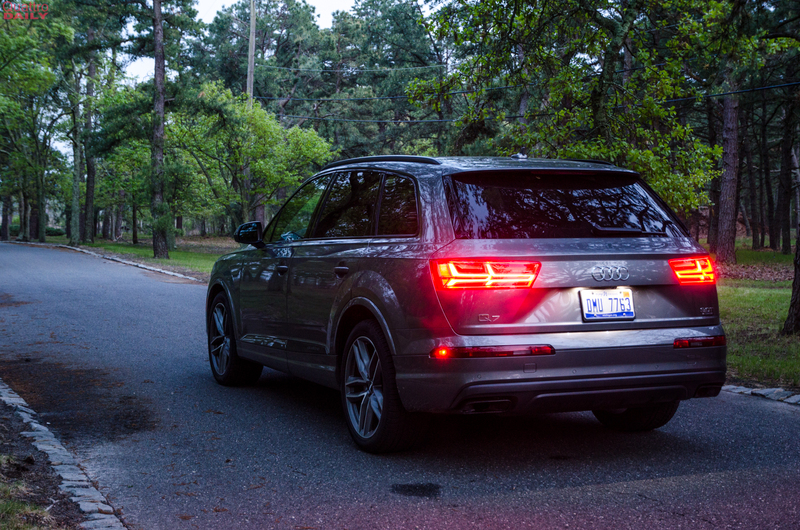 We found out during a week-long test drive of Audi’s biggest SUV. 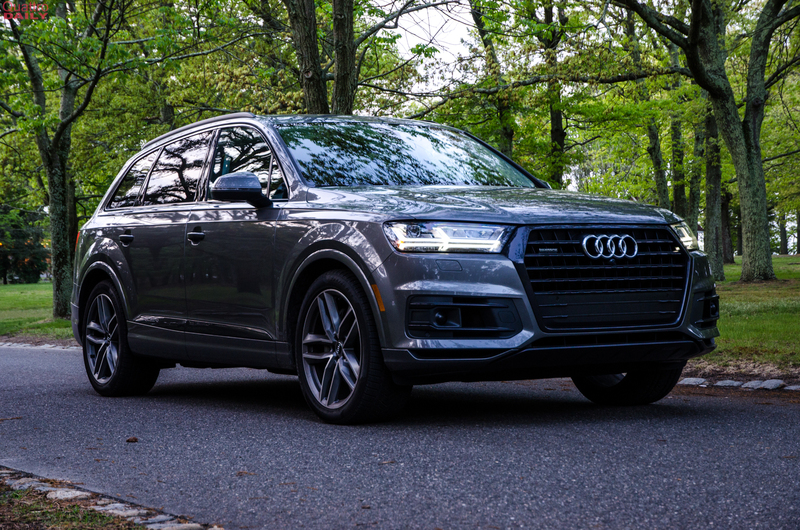 Out tester was a 2018 Audi Q7 3.0T Quattro and it was loaded with just about everything it could be loaded with. 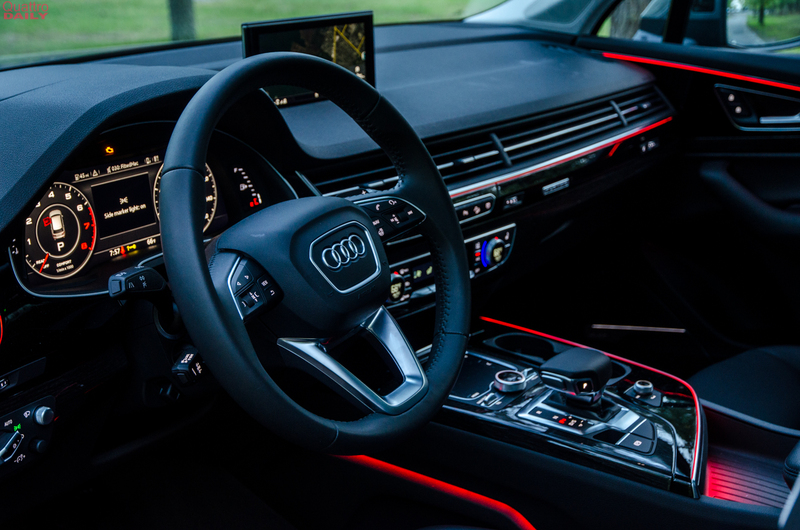 It wore Audi’s Prestige trim, which by itself brings 20-inch wheels, Audi’s upgraded MMI system with Virtual Cockpit, Bose 3D Surround Sound, Head-Up display, LED interior lighting, a warm weather package and among other little goodies like power soft-close doors. Just that alone is a $9,000 option, which is a lot of money but it does make the Q7 about as luxurious as anyone could ask for. 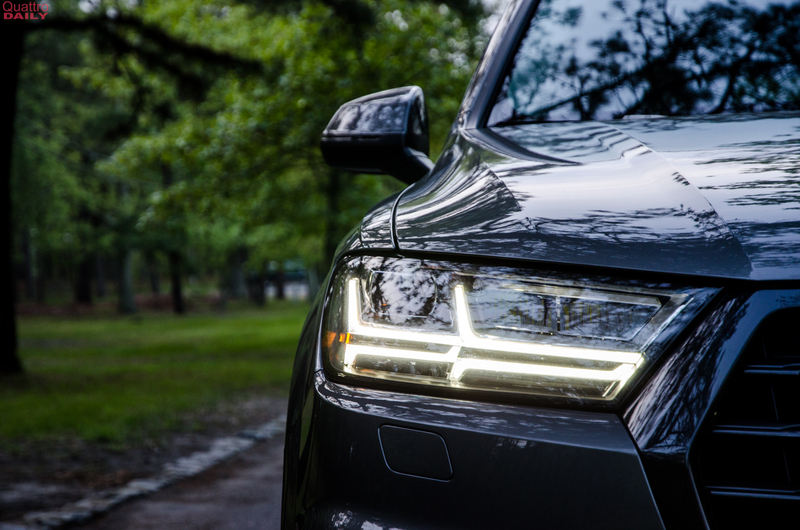 In terms of sheer curb appeal, there’s no question that the Audi Q7 is still competitive in the segment. 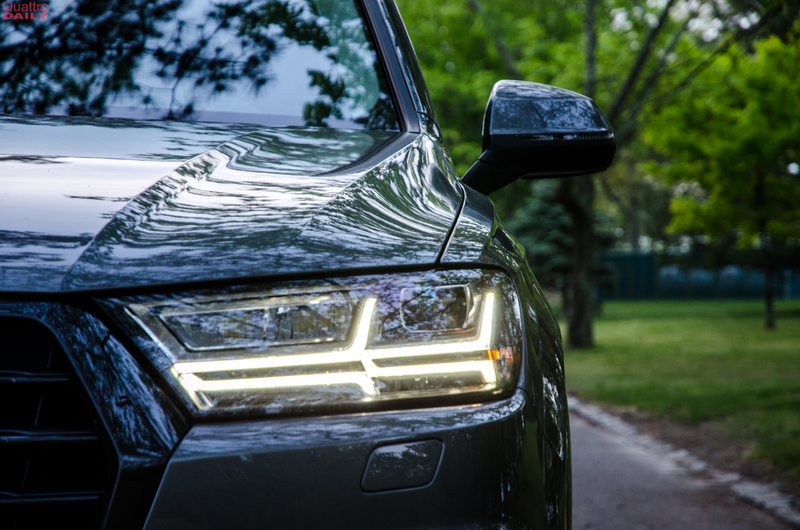 Even when parked next to more expensive cars, our Q7 tester turned heads and it made us happy that it was what we were getting into. 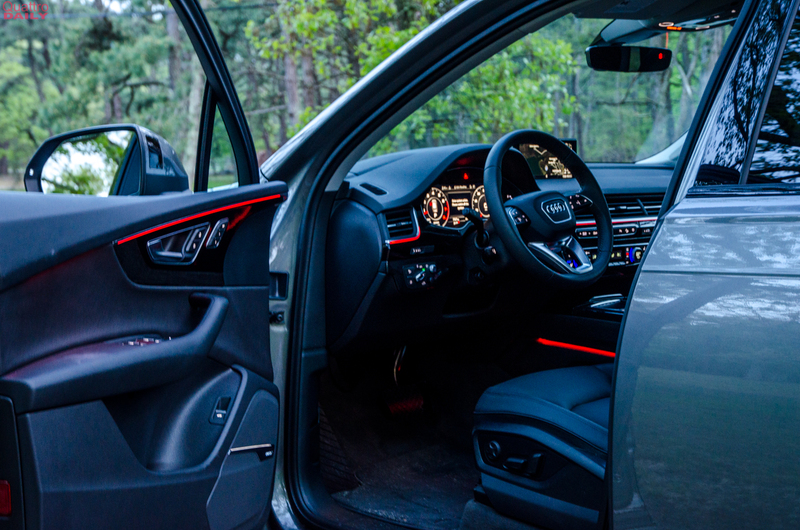 Stepping inside the Audi Q7 is still a lovely experience. 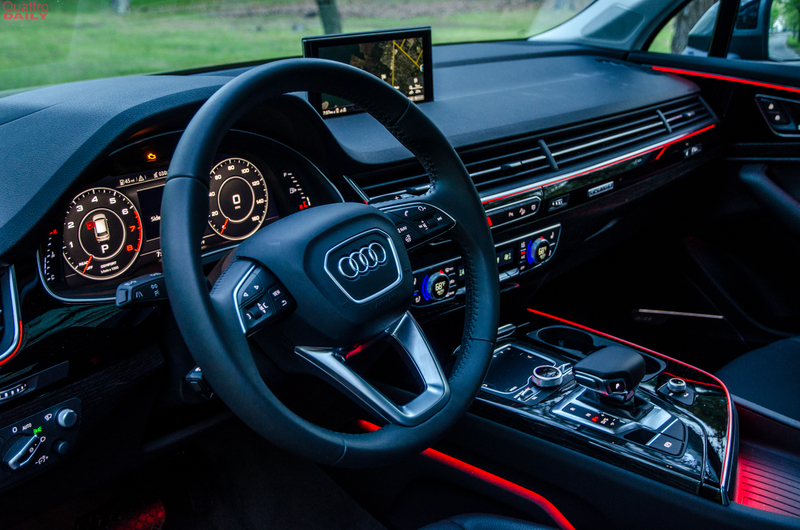 While the design is no longer new, it still looks fresh and modern, with its horizontal air vents that span the dashboard, very modern steering wheel and the ultra slick and high-tech Virtual Cockpit digital gauge cluster. Our tester wore black leather with high-gloss Black/Oak Gray Wood inlays, which is personally my favorite interior color combo for the Q7. It looks luxurious, modern and classy. And everything is exactly where it should be, as per usual. 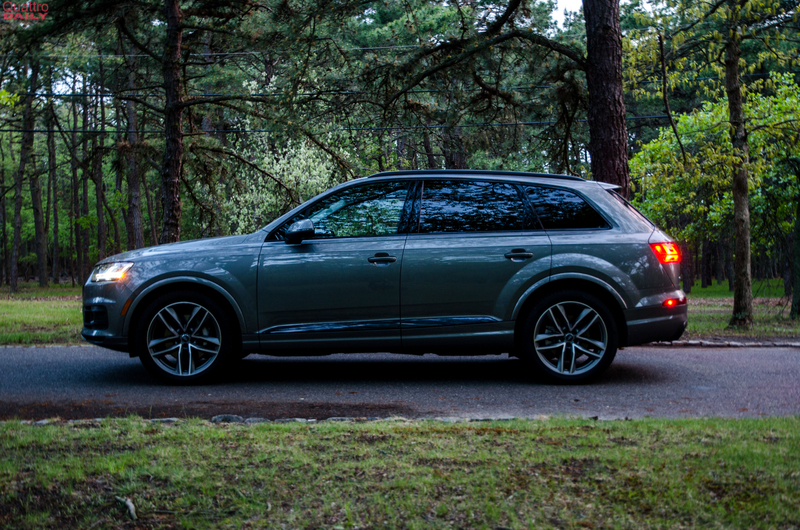 Audi simply nails ergonomics in almost every car it makes and the Q7 is no exception. It’s simple and minimalistic but also elegant and luxurious. 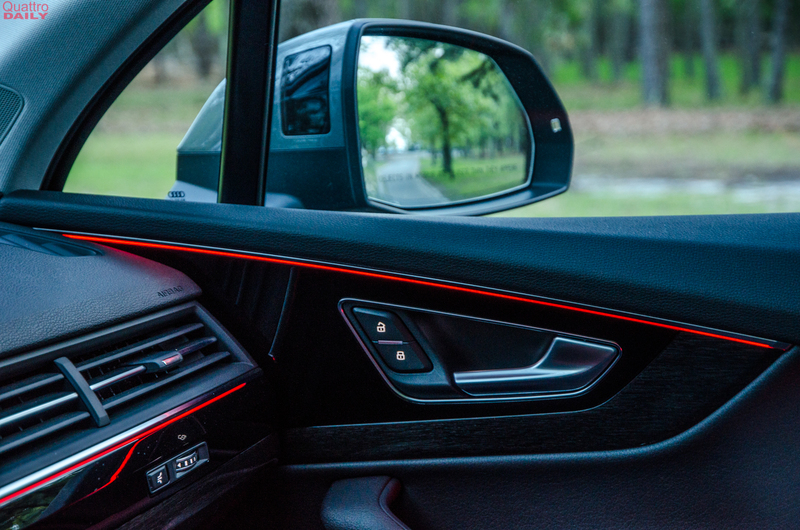 At night, its highly configurable ambient lighting brightens up the cabin and makes it look and feel special. You can also completely customize the lighting between different zones and colors. It’s really quite remarkable. Though, we left it red all the way around because it just looks cool, doesn’t it? 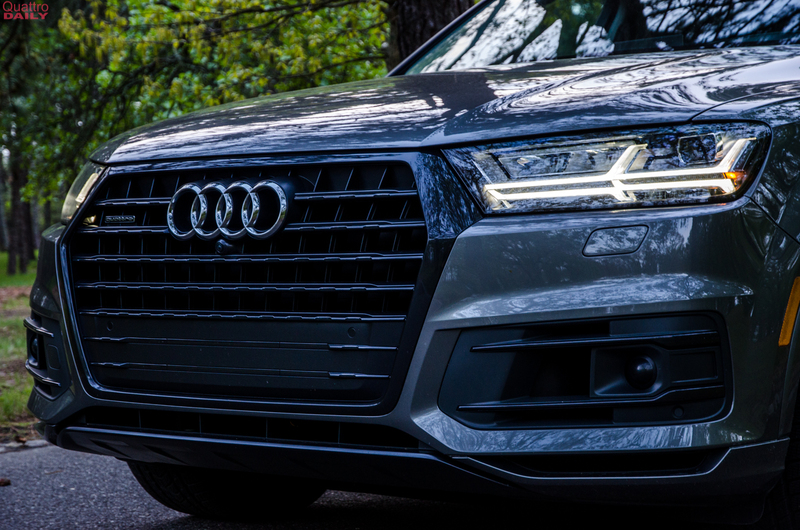 So the Audi Q7 still looks as fresh as ever, inside and out, and it’s one of the best looking cars in the segment. Despite being one of the oldest cars in its class, it can hang with all of the newcomers without question, especially when wearing its Black-Optics package. But how does it stack up on the road? 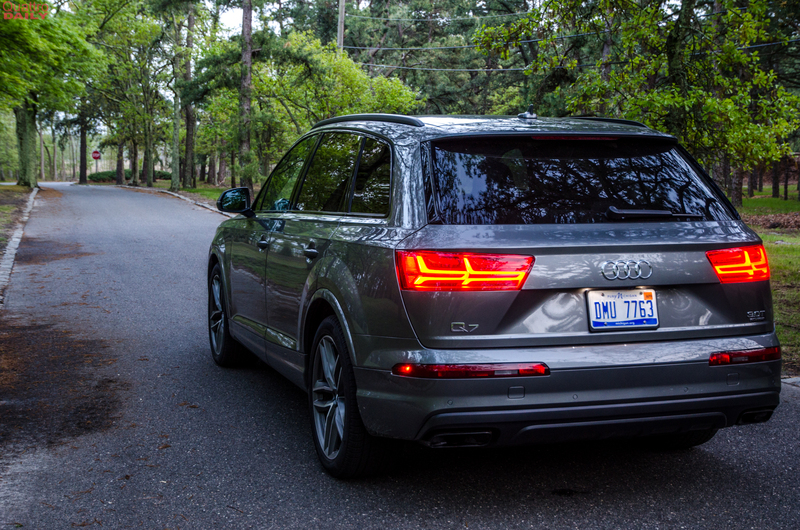 When you actually get behind the wheel and start to drive, can the older Q7 still compete? Under the hood lies a 3.0 liter supercharged V6. Yes, it says “3.0T” on the back of the car but despite the ‘T’, it’s not turbocharged, it’s in fact supercharged. 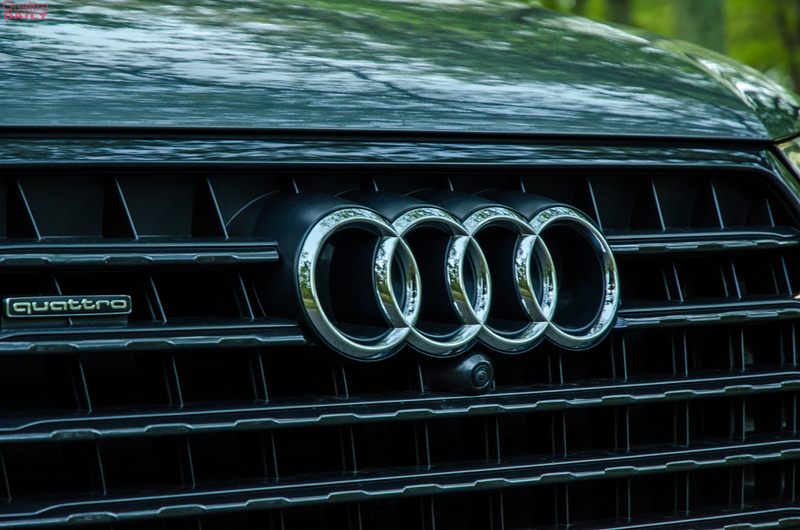 It’s an older engine in the Audi lineup, having been used on the previous generation Q7, as well as the B8 Audi S4/S5, but it still gets the job done. 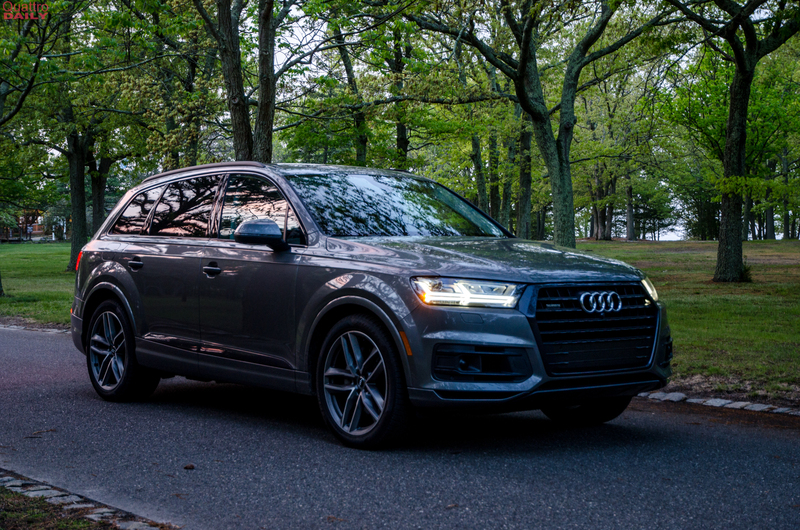 It makes 333 hp and 325 lb-ft of torque, which is a bit down on power compared to its newer V6-powered rivals but it’s still enough to motivate the Q7 from 0-60 mph in 5.7 seconds, which is still competitive. It’s also still a good engine, with smooth power delivery and even a decent noise. If you listen carefully, you can even hear a bit of supercharger whine under heavy acceleration, which is always cool to hear in an SUV. 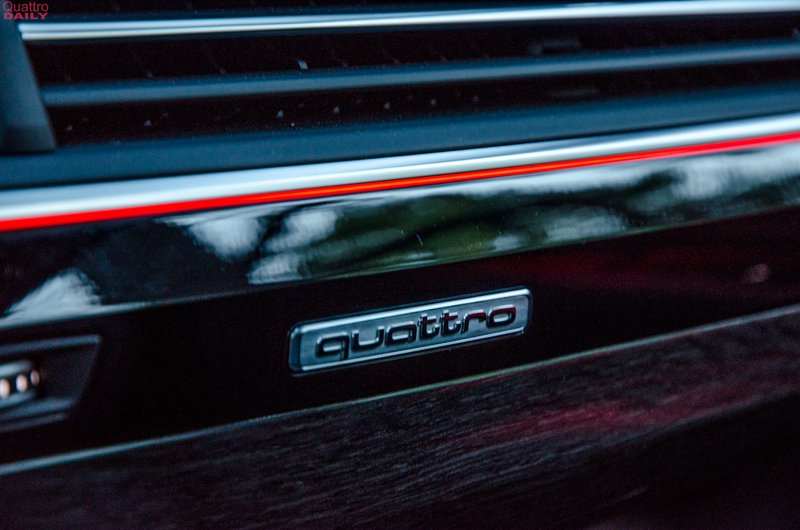 Paired with that engine is an eight-speed automatic gearbox that sends power to all four wheels, via Quattro. The best compliment I can give the transmission is that you won’t notice it. 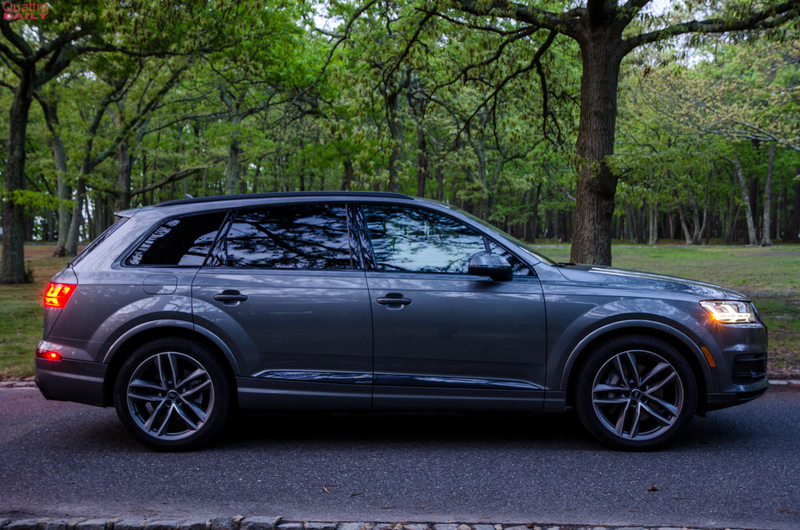 It never puts a foot wrong and always keeps the Q7 in the right gear. 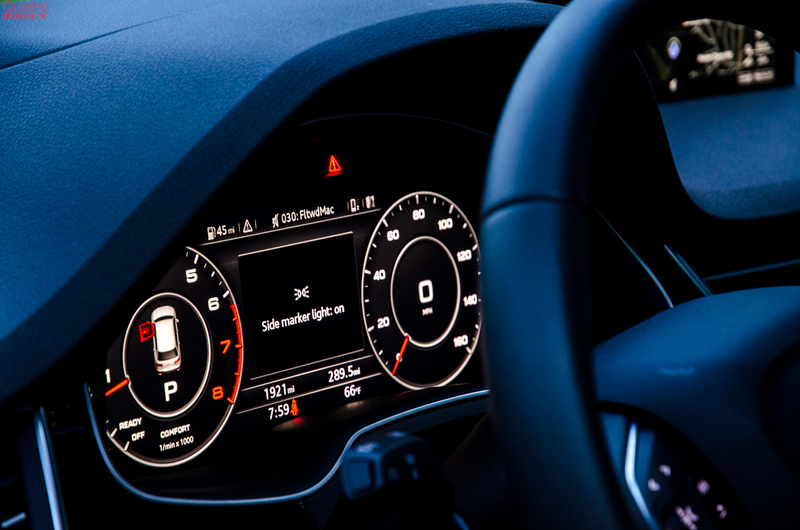 Mash the throttle and it’s quick to downshift to the right gear and get the big, heavy Audi moving. 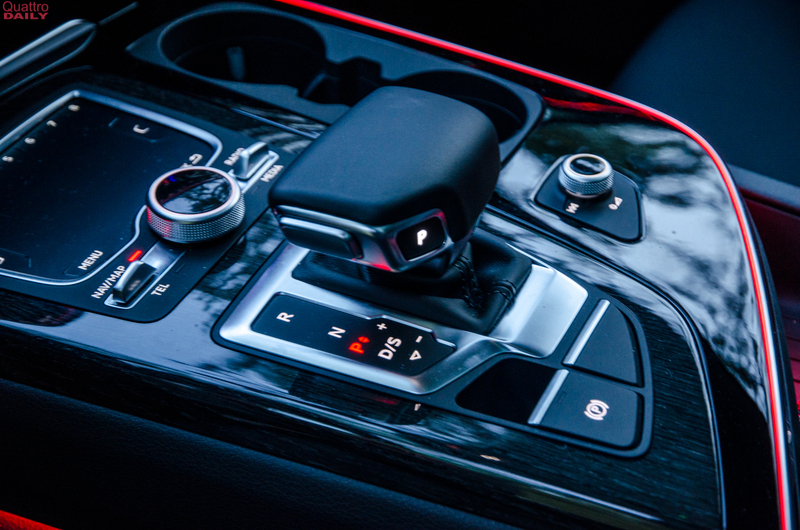 Slap the shift lever into manual mode and start using the steering wheel-mounted paddles and it shifts quickly, when you ask it to. For a luxury SUV, it’s the perfect gearbox. 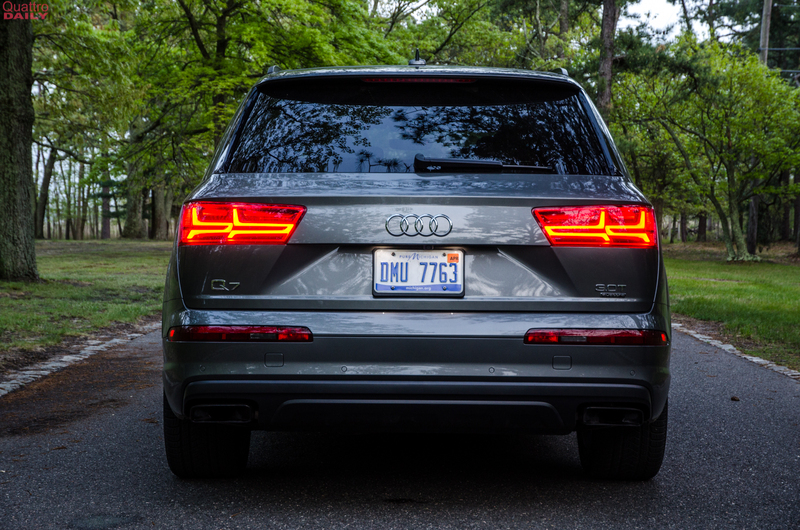 Once on the move, the Q7 is extremely impressive. That option Adaptive Chassis Package is brilliant, bringing adjustable air suspension and four-wheel steering. The former has five different height/damper settings, both of which are tied to the Drive Select modes. The latter are as follows: Off-Road, All-Road, Comfort, Auto and Dynamic. 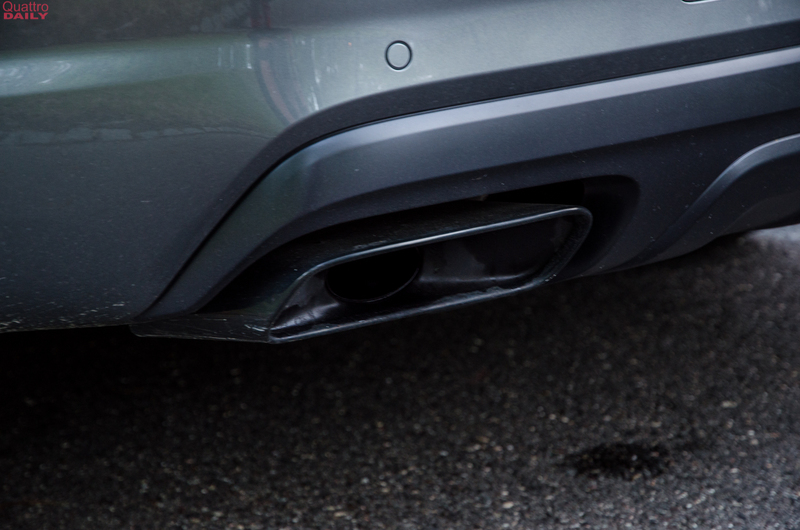 In Off-Road mode, the air suspension is set to its tallest setting and is designed for tackling so really gnarly terrain, though it can only be used under 20 mph. 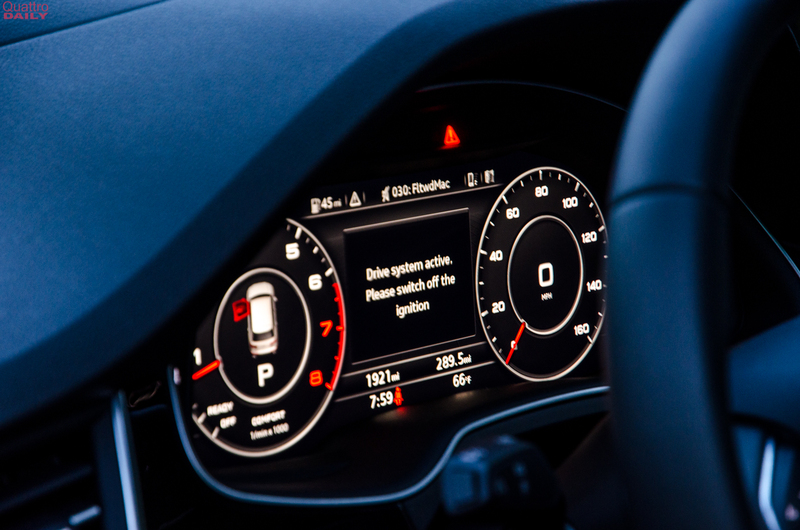 Once above 20 mph, it automatically goes into All-Road mode which is designed for general off-road/on-road use and uses the fourth highest setting. Comfort mode is the standard mode and it uses the middle height setting. 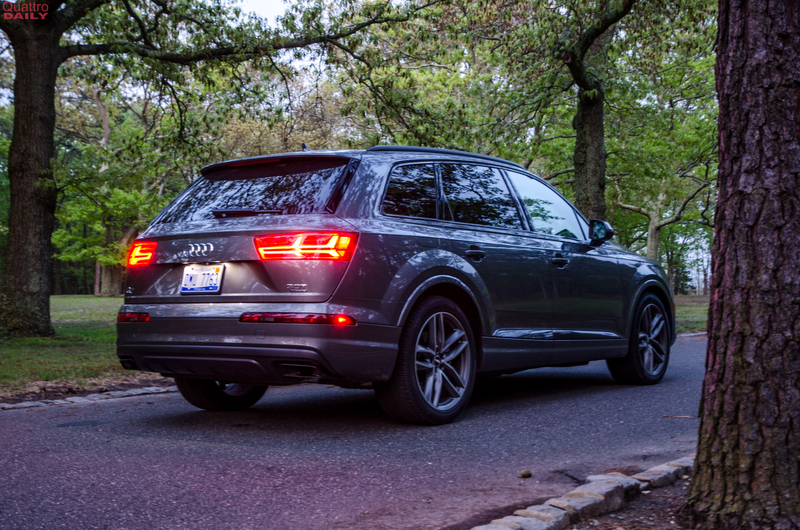 In Comfort, the Q7 is supple and comfortable, swallowing up big bumps with ease but always feeling composed. 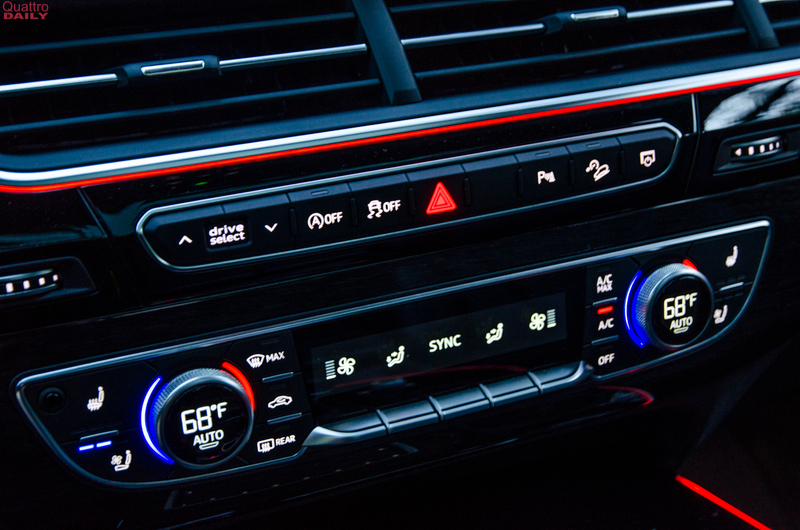 Auto mode is as it sounds, automatically adjusting to your driving, getting more comfortable when you’re just cruising and getting sportier when you’re on it. Dynamic mode is the sportiest setting, putting the suspension in its second lowest setting and firming everything up, making the steering a bit heavier and the suspension will even load up one side of the car to keep it nice and flat through corners. 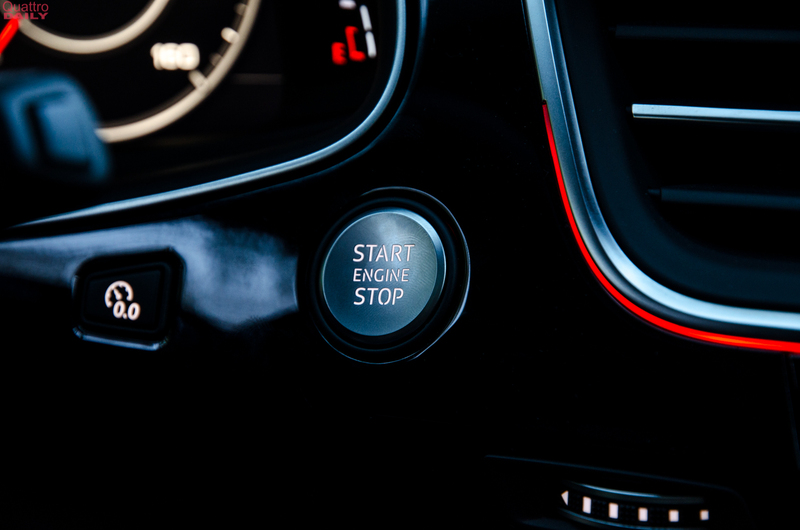 There’s also the aforementioned individual setting, which allows you to customize different aspects of the car’s settings. So you can make put the suspension, steering and engine in specific settings and create your own individual preset setting. 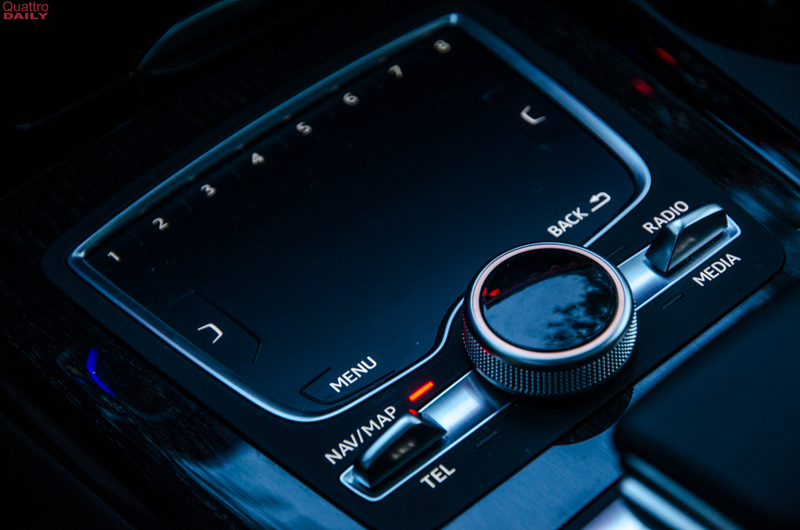 This way, you can tailor the car exactly as you like it and one button puts you in your individual mode.That allows you to create a sort of Goldilocks setup, as one of the other presets might not be perfect for you. 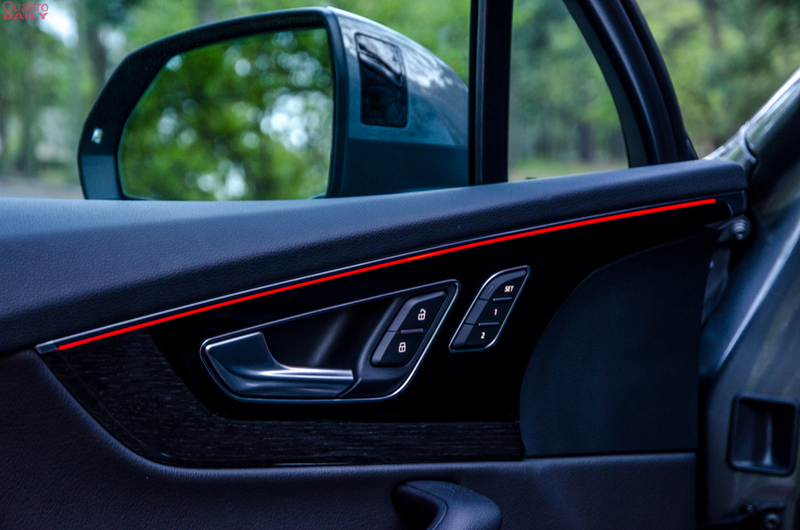 This is also unique in the segment, as cars like the BMW X5 and Mercedes-Benz GLE-Class do not have such a setting. The other feature that the Adaptive Chassis Package brings is four-wheel steering, which makes a remarkable difference. 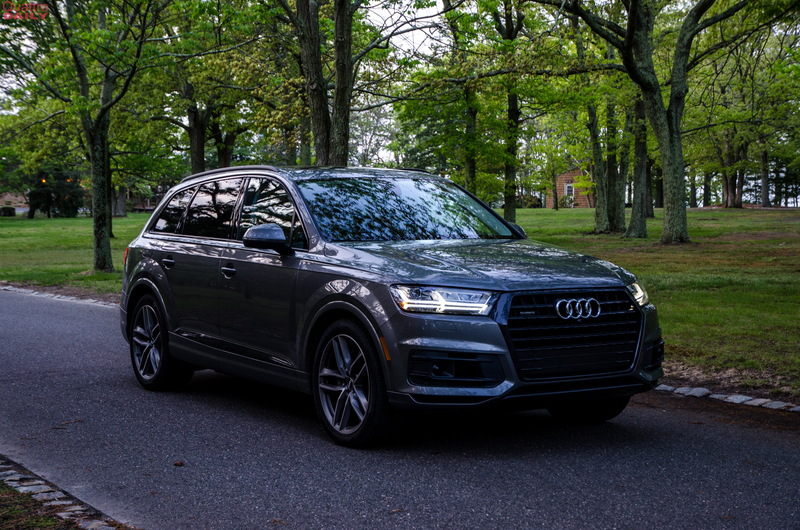 With the rear wheels steering a few degrees opposite of the fronts at low speeds and with the fronts at high speeds, the Audi Q7 becomes a surprisingly agile athlete, despite being quite large and quite heavy. 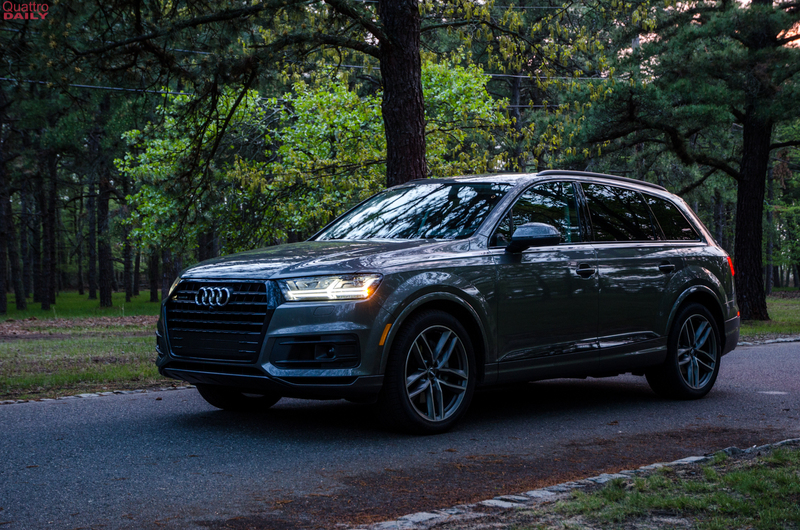 At low speed, the four-wheel steering system effectively shortens the wheelbase by giving the big Q7 a surprisingly tight turn radius and far better agility than you’d expect from such a big car. At high speed, it creates better stability and makes it feel far more sure-footed, even when approaching lose-your-license territory. Just the four-wheel steering system alone is worth the $4,000 package. 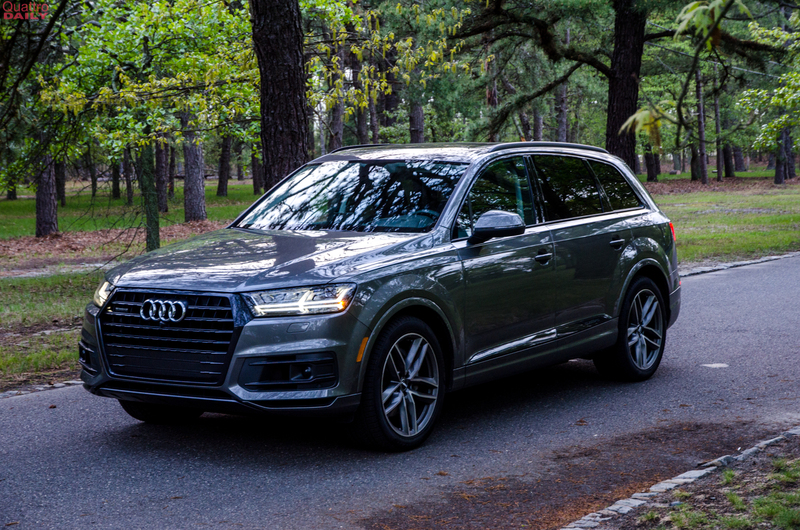 We wouldn’t say that the Audi Q7 can hustle down a twisty road but it’s no slouch. There’s no hiding its heft but it’s more fun than one might expect. 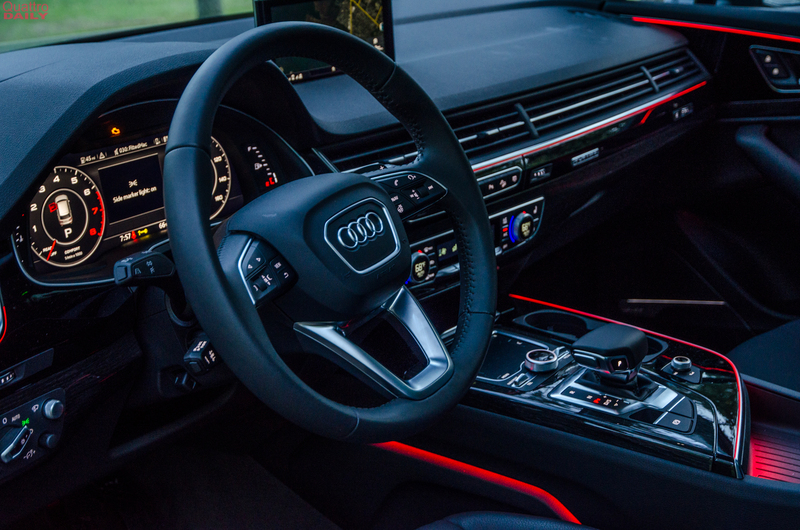 Steering is accurate and you can place the Q7 where you want it, even if it isn’t exactly razor-sharp. And the combination of air suspension and four-wheel steering allows it take some high-speed sweepers with composure and even some enthusiasm. It’s no Audi SQ7 or BMW X5 M but it’s certainly fun for a three-row, seven-passenger SUV. 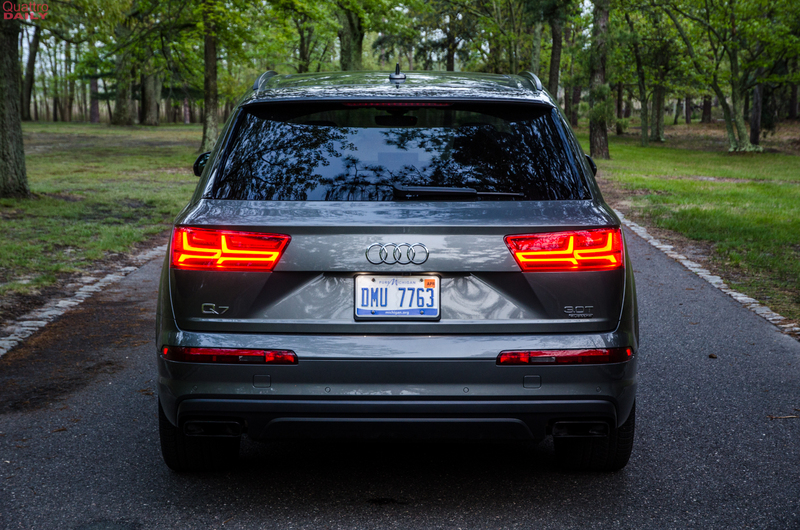 Which leads me to the rear beauty of the Audi Q7. 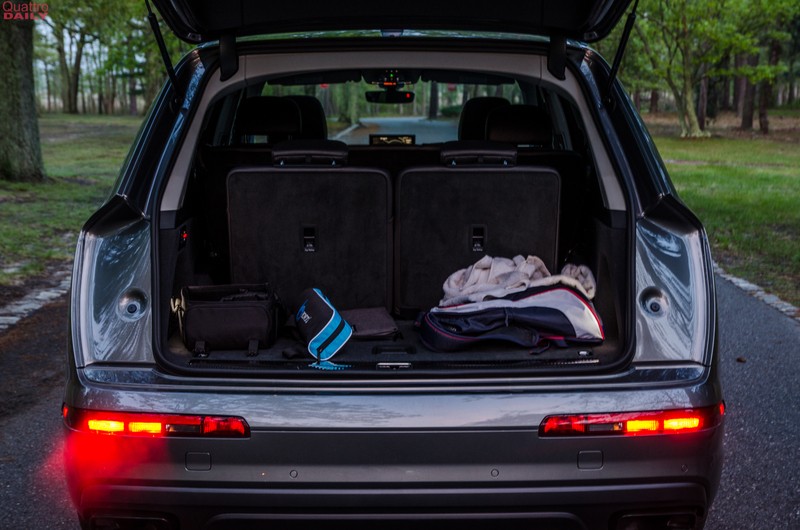 It packs all of that aforementioned luxury, performance and relative fun in a car that can seat seven passengers with stuff in the trunk. 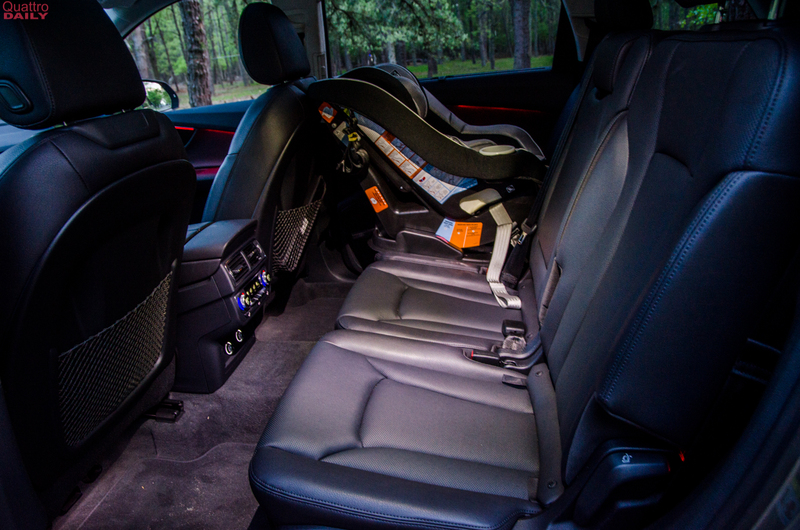 While the third row is only good for two small children, that’s perfect for a growing family. And second-row passengers will be seated in more than enough comfort, as middle-row seats both slide and recline. So it’s an excellent SUV for taking the family on a long road trip. 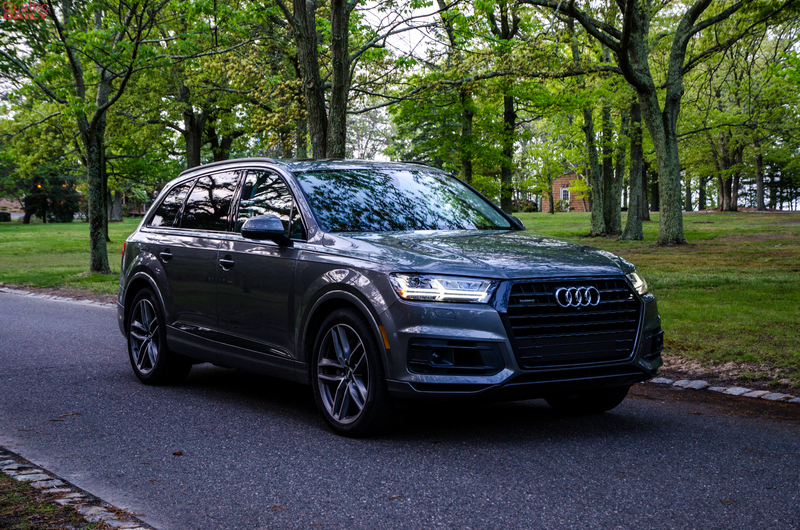 When you combine that versatility with its impressive luxury, performance and handling, the Audi Q7 becomes a car that can literally be everything and do everything. Yes, our tester was expensive, with an as-tested price of $75,700. However, for that money, you get all the car your family will need. It can be your only car and you’d never want for anything more. 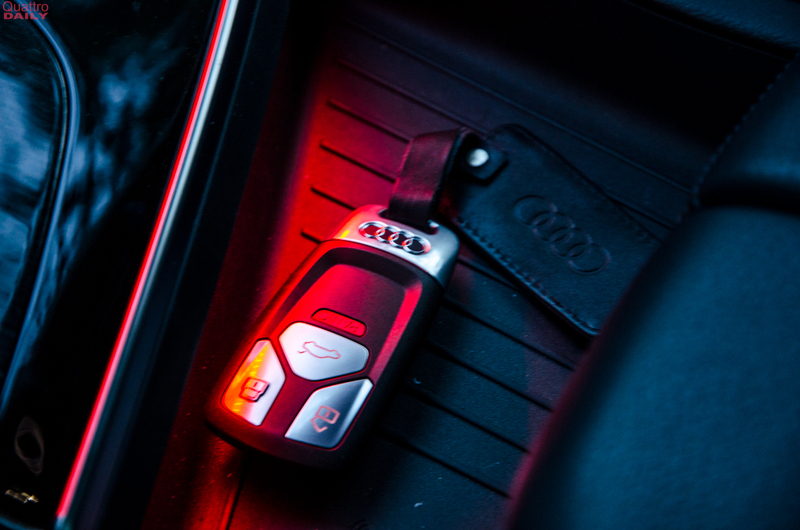 Throw in sharp looks, some of the best tech in the business and build quality that shames even some of its newer competition and you have a car that’s well worth its high asking price. So despite the fact that the Audi Q7 is one of the older cars in the class, it’s still at the top of its game and the top of the segment.